After completing the Jaguar and Dragon, the rigging project continued to grow at Cogswell and has since been named Project Avatarah. I continued my work in developing more character rigs and after working on a couple of simpler bipeds that were styled more along the lines of popular characters such as Norman and Hogan, we went into designing the next set of bipeds with a higher-level design geared towards detailed acting and subtlety in motions. Caroline is the first rig we developed with this mindset and includes features such as bendy limbs, proportion adjusters, IKFK spine, breathing controls, and a toony facial rig capable of squash deformations. 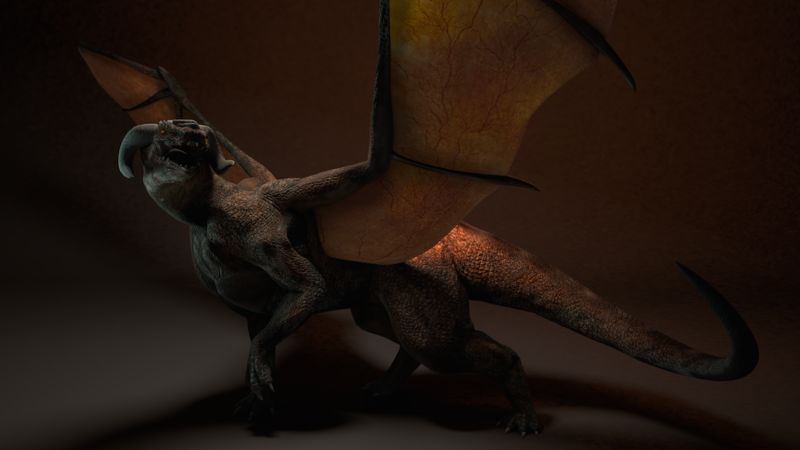 If you like to check out the dragon rig, it’s now available on Cogswell’s website here. This is continuation from the project I started on last summer with making rigs for the animation classes at Cogswell College. After finishing up the Jaguar, I shifted my work onto the dragon named Cogswell (to loosely tie the character to the college’s mascot), which was modeled and textured by Robert Garcia. With the dragon’s design being pretty close to a quadruped I was able re-use most of the rig techniques from Toothy: IK/FK legs, FK tail, and a IK neck. Things became more interesting when approaching the unique aspect of Cogswell: the wings.